Strange isn’t it…I wrote last month about why I won’t join the CIPD and the blog had its busiest day since I took the mickey out of formal training sessions last year. To save you reading the post again, my concern is that the CIPD isn’t relevant to learning and development professionals. It seems that the CIPD polarise views more than many other professional bodies. I had a number of replies on the blog, via twitter and email that both agreed with me and stated the CIPD position. Sam from weelearning agreed with me and also recognised the ‘gang’ recognition that being part of the CIPD has. Alistair recognised this as a niggling feeling and I wonder how many L&D professionals renew their subscription as a result of this feeling. The value of the CIPD’s research was addressed by Martin Couzins and I agree, the research that appears to be moving the industry right way. I say appears as the report is locked behind the membership wall and I can’t see what the CIPD is saying. Join the CIPD then you say? But what value does this report provide me? Does this research add anything to the work of Czikzenthihalyi, does it challenge the horoscopes of learning styles and MBTI? Publish the report for free and show L&D outside the CIPD that you’re serious in taking our industry forward. Perry Timms commented that I might want to look for what I’d want from the CIPD, using an AI approach. I’d agree that this would work in a world where the collaboration that I undertake on a daily basis didn’t already exist. Perry also suggested keeping in dialogue with the CIPD and there was a robust reply from Gill White, the CIPD Capability and Career Development Director. Prove your relevance – for someone who wants to start in the world of L&D, the CIPD used to be the place to start to learn how to train. It doesn’t seem to be much different now – the CIPD HR profession map still talks about ADDIE and delivery relevant to learning styles. Do we want to set new L&D professionals off into that kind of world? Prove your value – don’t hide content behind your pay site, make everything free, open source and available to all. Locking content down doesn’t protect value for your subscribers; it devalues your work when content is freely available across a range of other sources. Even if you lock the content down, the conversation is taking place outside of your site so you might as well let people use the source material rather than the chinese whisper copy. Prove your engagement – use your twitter channel to engage in discussion. I’m really pleased for people who have passed their CIPD – it means a lot to them and they’re probably delighted the CIPD recognise it enough to re-send their tweet. Where was the CIPD during the recent #trainingcrimes twitter storm? Phil Willcox, CE of e3 started the topic and soon L&D professionals across the world were calling out bad practice in L&D. Some humourous, some dangerous, all valid. And all, apparently, ignored by the CIPD. You want L&D professionals to be engaged and stay in touch with you? No, you should want to stay in touch with me. Keep sending me marketing emails encouraging me to re-join the CIPD at 5.30 on a Friday afternoon and you’re doing nothing to shake your image of being irrelevant, overvalued, and unengaged. Timely piece for me as I spent some time last week with my eLearning Network colleagues discussing what our members want and what they get from their membership based on a survey we ran recently to get some insights. 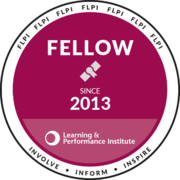 In a way the eLN has to be different because we’re not offering accreditation in the way that other professional bodies are. Therefore we have to work harder to provide other benefits around great events and networking opportunities. One thing that came out pretty loud and clear is that in this day and age of such freely available content and information, it’s the wrong approach to try and protect too much. And new communities like Wee Learning and L+D Connect are springing up without an agenda or a financial model to support – therefore everything they do and talk about is available for free, making it difficult for established (legacy?) models to compete. It’s a bit like the challenge newspapers are faced with and ultimately I think most of us want good journalism without necessarily paying for it. The same goes for the CIPD’s excellent research, we want it but not necessarily at the price of the membership. It’s a challenge that member organisations are facing across different industries and I agree there needs to at least be some middle ground and some willingness to open up and share, and more importantly (as you rightly say) *engage* with members and non-members alike. Asking what good looks like for you is an important first step. There has to be ways of providing value that will create irresistable propositions to join member organisations, and it would be nice if in the L+D community, we can figure it out together. Years ago when i was studying, I could have undertaken an additional module that would have got me CIPD – qualification/status/accreditation? The consensus was then “don’t bother”. Later, I met various people who were proud of their CIPD membership, and I revisited it, talked to clients and I decided to join. I worked very hard; i had to create a portfolio of evidence reaching over six years, research and write lots around core competencies, and prepare a management report which at 10000 was a short dissertation. I had several supervision sessions to challenge and support my learning and thinking. Overall, a good learning experience and a good introduction to the CIPD. Then, came the disappointment, and last year I wrote and advised that due to a number of ongoing disappointments, I would not be renewing my membership. I had worked hard for it, and felt gutted that I had put so much into an organisation that was, basically, ignoring me. I had a positive response that made me feel a little more optimistic. This year, it’s renewal time, and I’m thinking differently; it feels like there is an energy to hear perspectives like yours and mine, and an ambition that is less about being thought leaders, but more about being action leaders. I heard Peter Cheese being mentioned on late night talk radio whilst driving home on Saturday! I think with the current leadership and energy, some of the new posts that are being created along with evidence of engagement from some of the team on twitter point to opportunity to make a difference. Yes, there’s loads to change, but, if you’re not a member, it’s not your business. is it? Thanks Kate, I think legacy models is an interesting discussion point. Who pays is relevant across a number of industries now, especially in L&D. Thanks Meg – I think the suggestion that change is happening is entirely right. I’d like to see real evidence of change first rather than commitment to tackling the issues. And do I have to be a member of an organisation to comment on its activity? Hi Andrew, no of course you don’t have to be a member to comment on it’s activity!! I’m a believer of changing from within, and a bit curious that there are non members who whilst being critical also appear to have an interest. Thanks Meg – I wonder if engagement needs to be done internally too? Really enjoyed your two posts on this, Andrew. They echo numerous conversations I’ve had in recent years. I don’t know whether the issue is that the CIPD perceives L&D to be too small a constituency to concentrate on properly, or if they’re simply spread too thin and those working in other specialist areas like reward or employment law feel equally left out. It would be nice to see some real action taken about instead of just hearing about it in the run up to HRD. Some of the changes being talked about by the CIPD would be a welcome start. However, I can’t see any evidence of it yet. The latest issue of People Management had 86 pages. The number of L&D focussed items in that issue? One – a half column at that. Another good post on the topic, Andrew. In the week that we have the connectingHR unconference, I find the emergence of new spaces for discussion and development based on need very compelling. I hope more and more of these spaces emerge. And I hope they increasingly cross over into other disciplines because that is where L&D thinking can be broadened out. Thanks Owen – Sam referenced L&D being part of HR on the original blog post and it’d be nice to see L&D pushed up the CIPD agenda. The talk of commitment I mentioned previously hasn’t been followed through with actions yet. Thanks Martin – the traction of new spaces will be key. There are numerous other conferences, unconferences, collaborative sessions and networking opportunities which mean that part of the CIPD canon is now exposed. At least they tried something different (to what they’d tried before) with the hackathon. I wonder if it’s timely enough to gain the traction I mentioned above.